Gone are the days of 29 "dad" whips that handle like Grand Pappy's Studebaker. The Transition Sentinel X01 Complete Mountain Bike is more like the red Firebird that's here to steal your girlfriend - ready to dispel any lingering notion you've had of the traditional 29er. Slangin' Transition s all-new Speed Balanced Geometry and burly front and rear bump eaters, the Sentinel provides that playful and snappy ride you've been looking for, but with all the 29er benefits like better rolling resistance and straight line speed. Transition also equips the Sentinel with their GiddyUp 2.0 suspension design and swaggy SRAM X01 Eagle™ group set for maximum pedaling efficiency without sacrificing gnar-shred support on descents. 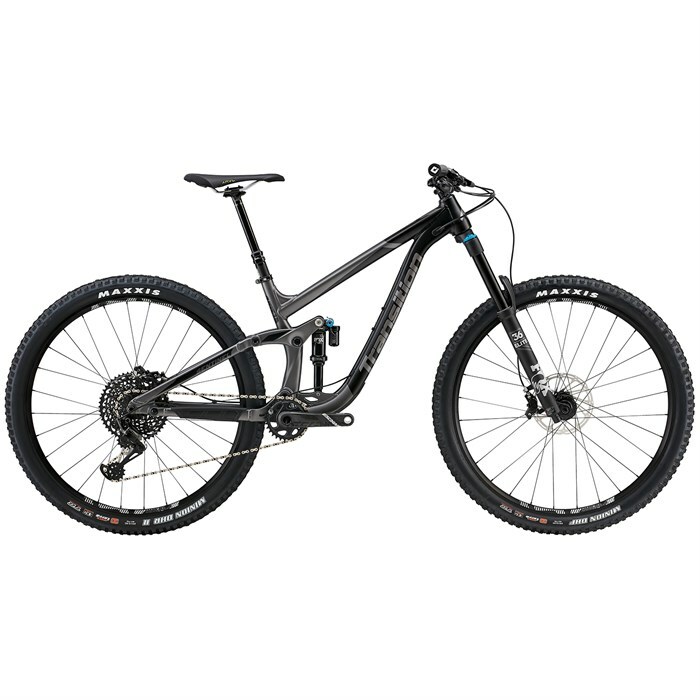 Serious performance meets over-the-top fun when you hop on the extremely progressive and powerful Transition Sentinel X01 Complete Mountain Bike. Fox 36 Float Performance Elite  More than an enduro race fork. Now featuring an EVOL air spring and updated upper tubes for unparalleled small bump sensitivity, the 36 is even smoother than before. Performance Elite forks retain the same adjustments, dampers, weight, and 7000 series aluminum upper tubes as Factory Series, but have black anodized upper tubes instead of Genuine Kashima Coat. SRAM Descendent Carbon Crankset  The svelte strength of carbon fiber with the swagger of heavy metal. The Descendant carbon crankset uses a proprietary TRUVATIV carbon construction process that delivers a crankset light enough for XC, yet bold and badass enough for Enduro. SRAM X01 Eagle™ 12-Speed Shifter  Tucked neatly beneath your handlebars, the X01 Eagle™ X-ACTUATION™ trigger shifter is the nerve center of the Eagle™ drivetrain. Its internal works have been updated to include a 12th gear, and improved to enhance trigger feel, precision and durability. Whether you’re 4 stages into the race or days away from civilization, the X01 Eagle™ trigger shifter is your faithful 1x touch point. SRAM X01 Eagle™ 12-Speed Rear Derailleur  This new derailleur not only answers the Eagle™ drivetrain’s need for greater capacity, but it’s also the next evolution of SRAM's proven, 1x-specific X-HORIZON™ design. The larger, 14-tooth X-SYNC™ lower pulley allows 10- to 50-tooth cassette capacity in this relatively compact design, and also adds to Eagle’s overall smooth-pedaling feel. The new, Type-3 ROLLER BEARING CLUTCH™ features a smoother torque curve for a quieter, more consistent operation and feel. CAGE LOCK™ has been moved back and out of the way, protecting it from trail debris. And a redesigned, robust mounting system further improves the Eagle™ derailleur’s performance and overall durability. SRAM Centerline Rotors  The new Centerline rotor was designed to keep the center of friction consistent throughout rotation, thereby minimizing vibration offering consistent performance and a quiet ride. Maxxis Minion DHF EXO Dual | Front Tire  The Minion DHF was designed for the often loose and muddy conditions of aggressive all-mountain terrain. The DHF incorporates ramped knobs for low rolling resistance and channel-cut knobs to increase gripping edges, giving straight-line control and precise cornering. Maxxis Minion DHR II EXO Dual | Rear Tire  The trail version of the Maxxis Minion DHR II features the same tread pattern as its downhill counterpart, but uses a single-ply casing to reduce weight. With side knobs borrowed from the legendary Minion DHF, but widened to provide more support, the DHR II corners like no other. The center tread features ramped knobs to improve acceleration and sipes to create a smooth transition when leaning the bike. Paddle-like knobs on the center tread dig in under hard braking and help keep the bike under control. Pair it with a Minion DHF up front for the ultimate aggressive trail riding tire combo!